On Wednesday November 9, 2016 America and the world woke up to the reality of a president-elect whose campaign rhetoric exposed him as xenophobic, patriarchal, sexist, and misogynist. Worse still, the president-elect has chosen an avowed and vocal (cf. Breitbart.com) white nationalist to be his chief strategist- Mr. Steven Bannon. And if the president-elect keeps his promise to appoint Rudolph Giuliani as attorney general, “stop and frisk” and the “rule of law” will be the means by which a racist, sexist, anti-immigrant and homophobic agenda will be carried out. Taken together these facts mean that the white supremacist sentiments that have been hiding underground for the past fifty-years are now evident for all to see. We watched as many white and politically conservative evangelicals endorsed the president-elect during his campaign. We could only surmise that the real religion of at least some white American voters is white supremacy. Why? Because the president-elect is the moral, and ethical embodiment of everything that conservative evangelicals claim to be against. Yet they chose a champion of white supremacist ideology over the “Christian” principles they espouse. 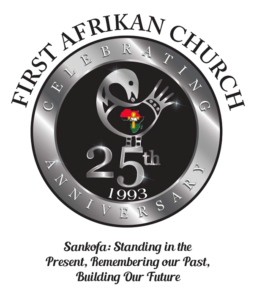 So, where do we the members, visitors and friends of First Afrikan Church; and the Afrikan, Latino, First Nation, Asian, LBGTQ and poor working-class people of all descriptions go from here? What do we who have been historically “othered” by the white, male (and female), American majority do in a socio-political and economic climate where people feel empowered and justified to overtly act against us? Walk in faith, not fear. Fear feeds the spiritual beast that is white supremacy. Faith starves it. So we believe in and trust God who has always been our help. We believe in ourselves and our own capacities to build the families, communities, schools, businesses and institutions that we need to sustain us. And we believe in each other, that each of us has moral and spiritual value. Shop at Afrikan owned establishments as often as possible. When it is not possible to shop at Afrikan owned establishments, shop only with those companies that do justice by our people. When that is not possible, make the sacrifice of going without whatever it is you are looking for if at all possible. Pray for and with one another as often as there is opportunity. Speak positively to and about one another at all times. Commit to meet with one another only when there is a purpose. Let’s not waste/squander our time and energy on frivolities. Rather, let’s recognize what time it is in America and in a world where white supremacy is gaining ground and determine to devote ourselves to the on-going and collective struggle for justice and freedom. Last but by no means least, COME/GO TO CHURCH ON TIME EVERY WEEK!!! We’ve come this far by faith in the God of our weary years and silent tears. God has seen us through every valley, every storm, and every mountain. And it is in the community of faith that we discover people with like minds and aspirations. “Do not neglect to meet together, as is the habit of some, but encouraging one another as you see the Day approaching” (Hebrews 10:25a).